Boston (Brookline), MA. Temple Ohabei Shalom (1922-28). Photo: Samuel D. Gruber, 2010. Boston (Brookline), MA. 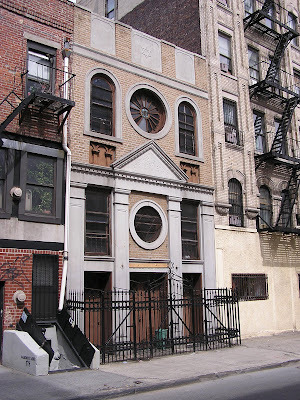 Temple Ohabei Shalom, 11 Union Park St (synagogue 1887-mid-1920s). American Jewish Historical Society as reproduced in The Jews of Boston, p 183. I was in Boston last week for the Association of Jewish Studies meeting, and stayed in Brookline with a friend. Riding the Green Line T I had to hop off two stops early to take some photos of the grand domed Temple Ohabei Shalom (OS), at the corner of Beacon and Kent Streets. 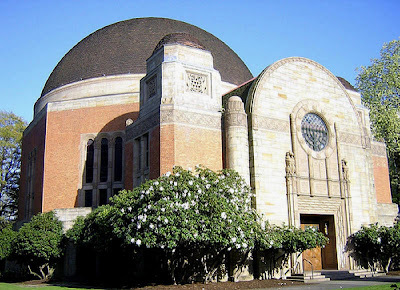 Dedicated in 1928, the synagogue was Boston's entry into the national Byzantine synagogue sweepstakes of the 1920s, where Boston set to compete with similar Byzantine-style buildings in Newark, NJ; Chicago (Temple Isaiah), IL; Portland, OR and elsewhere. 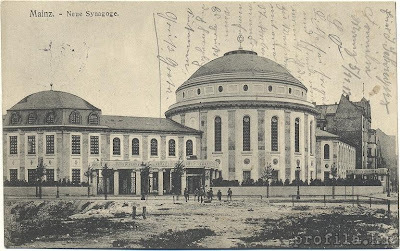 A free interpretation of the style was first successfully used for synagogue architecture in Sofia, Bulgaria in the early 1900s, and was soon adapted by American architects. Sofia, Bulgaria. Great Synagogue. Friedrich Gruenanger (1856-1929), architect (1905-10). This was the first major synagogue inspired in part by Hagia Sofia and other Byzantine buildings, but it also continues use of Islamic motifs. In Bulgaria (unlike Boston) Muslim and Byzantine styles are part of the local heritage. Photo: Samuel D. Gruber. Portland, Oregon. 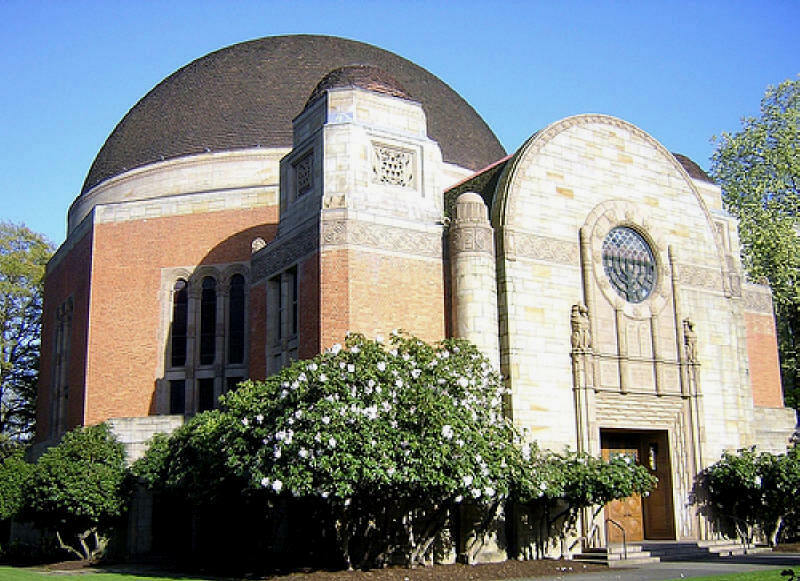 Temple Beth Israel, Morris H. Whitehouse & Herman Brookman, architects (1923). In the building the Byzantine style is influenced by Art Deco motifs. Photo: from postcard. Chicago, Illinois. Temple Isaiah, Alfred S. Alschuler, Architect (1924). This is one the most fully realzied Byzantine style synagogues, but it is more influenced by San Vitale in Ravenna than Hagia Sofia in Istanbul. Photo: Samuel D. Gruber. Newark, NJ. Congregation B'nai Jeshurun (now Hopewell Baptist Church), Albert Gottleib, arch (1915). One of the earliest American examples of the Byzantine style. Photo: Samuel D. Gruber. 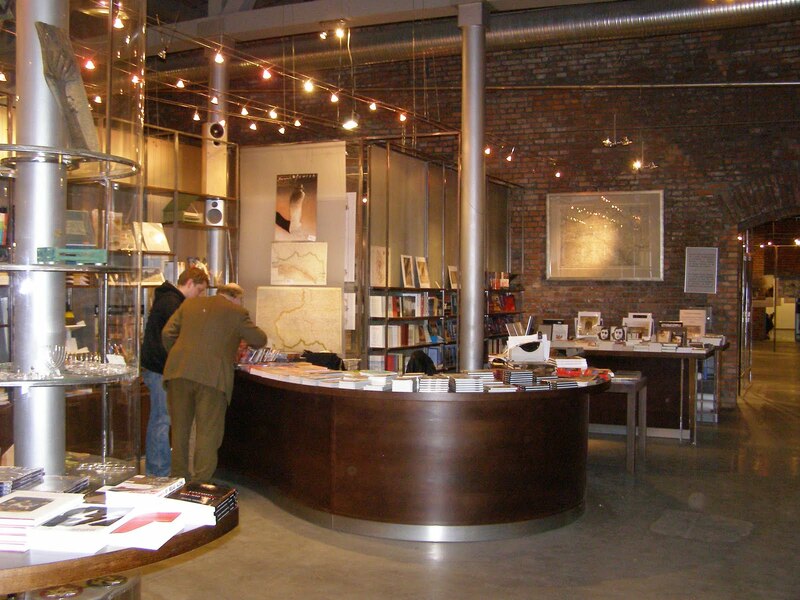 As David Kaufman has written in his essential article "Temples in the American Athens: A History of Synagogues in Boston," in Sarna et al, eds, The Jewish of Boston (1995, 2005), OS was also an fine example of the era's Synagogue-Center movement, where urban architectural monumentality was joined to the more many more mundane activities of sustaining a Jewish religious community. OS, Boston's oldest congregation (founded 1842) felt the need to position itself as a leader in architecture as well as communal education and programming. The building, designed by Clarance Blackall is one of many contemporary designs that derive from Istanbul's 6th century Hagia Sofia in the latest and last serious bout of Jewish architectural historicism. Blacknell had previously designed Congregation Adath Israel in 1907. The popular Classical style of the first decade of the century had, if anything, become too ubiquitous after World War I, and congregation strove for new ways to establish Jewish and congregational identity in the American world of religious and denomination competition. 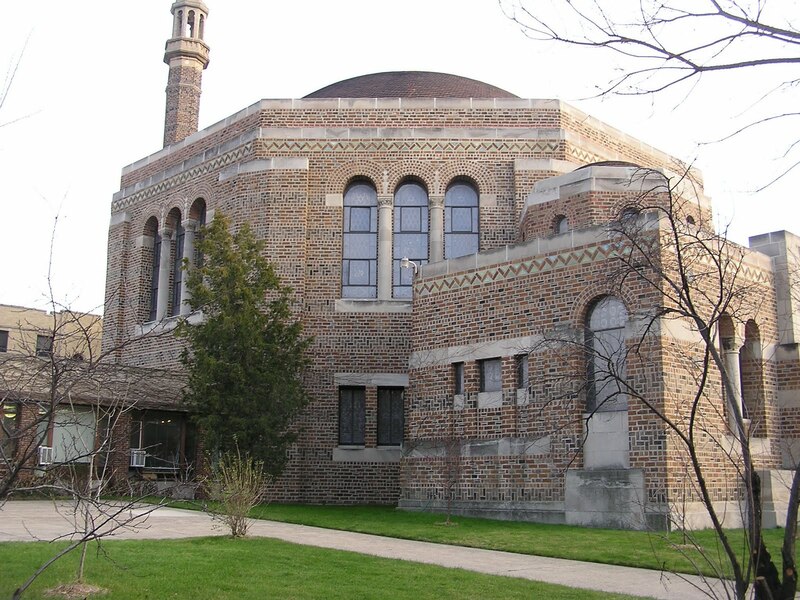 In Chicago, architect Alfred Alschuler first made the claim that the Byzantine style directly referenced ancient newly excavated synagogues of the 4th-8th century, thereby establishing legitimacy and precedent for the style, but it remains unknown whether anyone really believed this. Architecturally, the Byzantine style as adapted for synagogues allowed the prominent incorporation of a domed sanctuary space and its exterior expression, an architectural and communal element that had been evolving dressed in other styles since the 1890s. The domed interior space gave a great sense of communal unity, and usually also provided better acoustics and sight lines. "what is this New Temple Ohabei Shalom? Let me tell you at least what we shall strive to make it - a monument of the standing of the Jews of this metropolis of the 20th century! more than that; it is to be a witness to the fact that though we have risen in wealth and power, and though we yield to none of our fellow-citizens in love of country, we have not forgotten the rock whence we were hewn. in its artistic completeness, it is to be an offering recoding for years, or - may God grant - for centuries to come, at once the prosperity and the gratitude which are ours in being privileged to be counted among those who served this holy cause." Boston (Brookline), MA. Temple Ohabei Shalom presentation drawing, ca. 1922. Reproduced in The Jews of Boston, p 204. Blackall's original design called for a tall campanile-like tower to be set at the corner of the building, which would have been visible from afar, and also would have linked the building to the previous Ohabei Shalom (at 11 Union Park Street, now a Greek Orthodox church) which had a corner tower, and to the many Boston churches which employed this device of architectural advertising in the tightly built urban environment. The arrangement is described ca. 1925 as: "The dome is about ninety feet high and the tower is one hundred and seventy to the top of its Menorah. The tower, which has a lantern top, will provide a most distinguishing landmark on the long perspective of Beacon street. The lantern has a gilded patterned top surmounted by the Menorah and will have a large light source to stream from its arcaded windows." This tower is very different from the slender minaret-like tower Altschuler used at Temple Isaiah in Chicago, which actually masks a chimney. In the end the Ohabei Shalom tower was not built, which actually better emphasizes the geometrical integrity of the synagogue design. 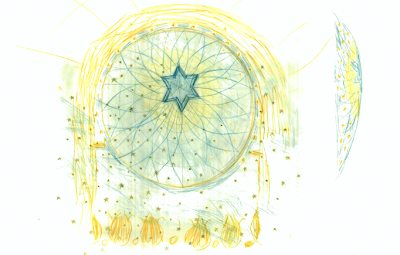 The dome drum windows were also changed, and it was until a recent renovation of the building that a towering menorah was installed, now atop the dome replacing an earlier simple Star of David. There is rich and intricate brick, carved stone and metalwork detailing throughout the building. My favorite element are the bronze shofars sculpted as door handles on the entrance doors. Boston (Brookline), MA. Temple Ohabei Shalom. Shofar shaped door handles. Photo: Samuel D. Gruber, 2010. The interior is also impressive, and over the past two decades the sanctuary has been restored to it original appearance. I'll report more on that space when I have a longer time to visit. Even before the sanctuary was built the congregation erected an adjacent school, activities and office building that still serves these functions. It was normal for synagogue centers at the time to be built in phases - and remains so today. I can think of several instances where congregations built their school buildings first with flexible space to be used for worship as well, and then never went to build their planned sanctuaries. The best known instance of this is Union Temple in Brooklyn. Ohabei Shalom's school wing is now as often reached by car as by public transport or on foot, so an ample parking lot is in the rear, and a new modern style entrance has been created in the back of the building - which now serves as the de facto front. Krakow, Poland. Galicia Jewish Museum. All photos Samuel D. Gruber, 2008. The Galicia Jewish Museum founded in April 2004 in Krakow's Jewish quarter, Kazimierz, has appointed a new director, Kazimierz-born Jakub Nowakowski. Nowakowski has worked at the museum since 2005, most recently as its education direction. 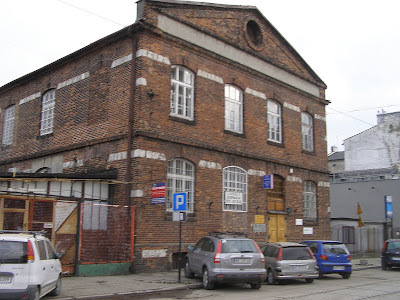 The museum is located in a former mill building (see photo above) on the edge of Kazimierz, the former suburb to Krakow's Old Town where Jews were permitted to live, and where a vibrant Jewish culture developed over a period of five centuries. 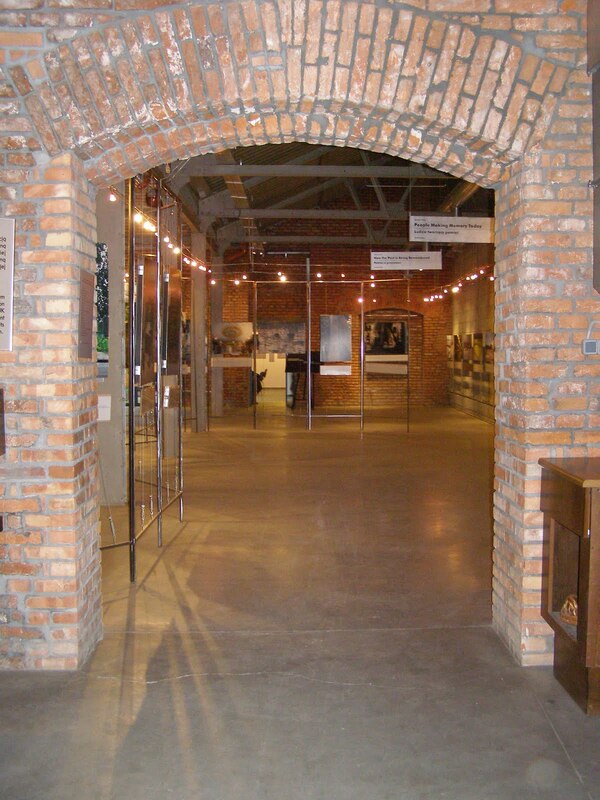 The mission of the museum is "to challenge the stereotypes and misconceptions typically associated with the Jewish past in Poland and to educate both Poles and Jews about their own histories, whilst encouraging them to think about the future." Nowakowski will replace Kate Craddy who has returned to England, to take up an appointment at the Barber Institute of Fine Arts in Birmingham. 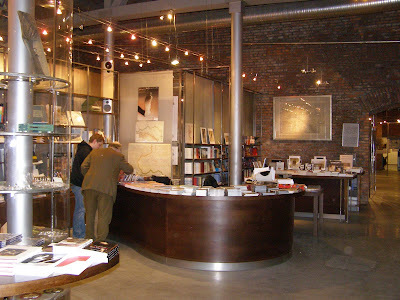 Craddy herself became director after the death in 2007 of the museum's founder, the British photographer Chris Schwarz. 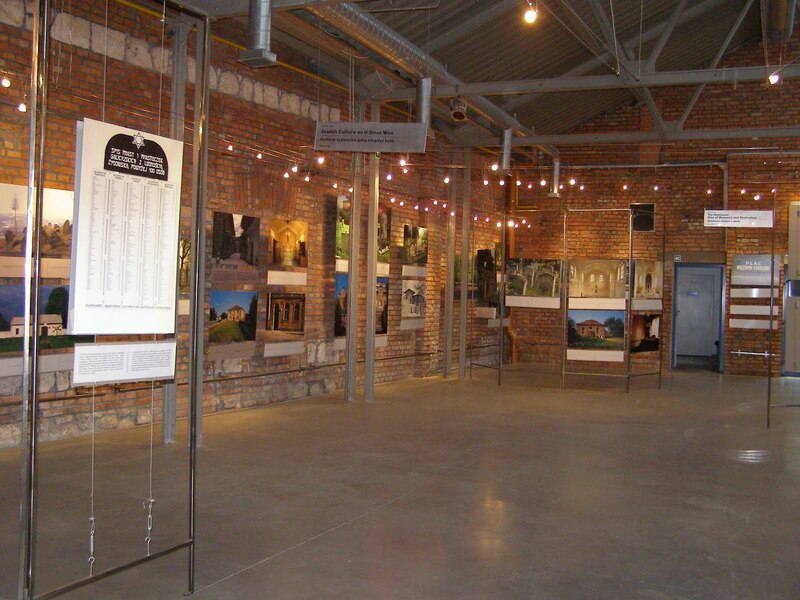 The museum's core exhibition is formed by Chris's photographs of Jewish heritage sites, taken mainly in the 1990s -- they also form the basis for the book Recovering Traces of Memory, with text by Jonathan Webber. I congratulate Kate on all she has achieved at the museum, and wish Jakub all the best in his new position. Nowakowski has an MA in History from the Department of Jewish Studies at the Jagiellonian University, as well as a postgraduate diploma in Management and Marketing from the Kraków School of Economics and Computer Science. He also holds a Tour Leader’s License from the City of Kraków. 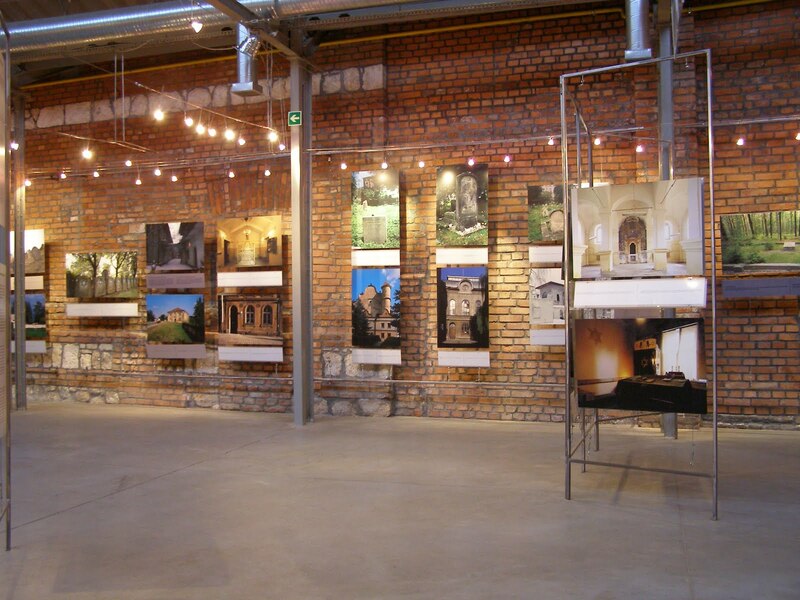 In addition to its permanent photographic exhibition, the museum hosts traveling exhibitions about history and art, and also has one of Poland's best Jewish book stores and gift shops, and a hospitable cafe that provides a good rest and meeting place in Kazimierz. My family was pleased to donate one of my mother's (Shirley Moskowitz) monoprints from her Polish synagogue series to the museum in 2009, based on her visits to ruined synagogues in 1993. The wntire series had previously been exhibited at the museum. The Galicia Jewish Museum employs over 20 full- and part-time staff, in Museum Operations; Education and Research; Projects and Publications; External Relations and Communications; and Finances and Administration. New Museum Director Nowakowski is supported by an active Board of Directors in Poland and a Board of Trustees in the UK, led by Chairman Prof. Jonathan Webber (UNESCO Chair of Jewish and Interfaith Studies, University of Birmingham). 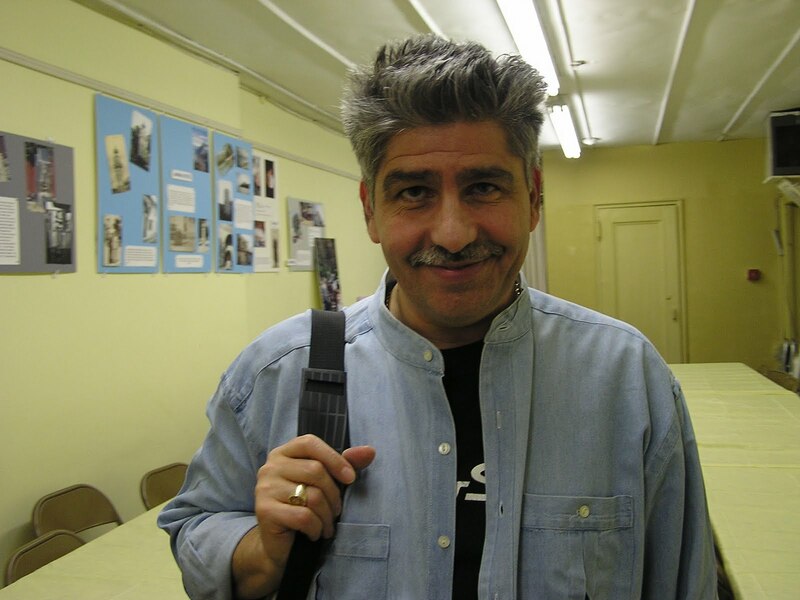 Photographer and filmmaker Vincent Giordano died on December 11, 2010. Vincent was an accomplished photographer with an artist’s eye, and a mastery of craft (especially visible in his beautifully handmade palladium prints) and the sensibility of a trained ethnographer. He was a man of warmth, humor, and modesty, but also of talent, ambition and tenacity. These were all qualities he maintained, even when in great pain, until his very last hour. In recent years Vincent brought these talents together in an intensive investigation of the small community of Romaniote Jews in New York, centered on the synagogue of Kehila Kedosha Janina synagogue on New York’s Lower East Side. Since 2002, soon after he began work in his documentary project Before the Flame Goes Out, he has been a friend and unexpected colleague. What began by my writing a simple cover letter for a grant became a continuing collaboration, with the International Survey of Jewish Monuments serving as a sponsor for Vincent’s work. Over a period of about six years Vincent created a remarkable series of photos of the building, and many of the people who still call it their religious and cultural home and related community events. 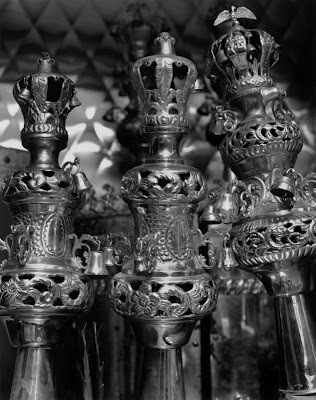 What began as a documentation of the synagogue building and its liturgical and historical artifacts evolved into a deeper and more meaningful investigation including photos, film and audio. Vincent found that it was not enough to look at a building without knowing the things inside or to know the objects without understanding their history and use. He believed that knowledge can only come through knowing the people who made these things, and who continue to use and cherish them today. Similarly, he felt he could not see full picture of this Romaniote community without its other half: the community of Ioannina, or what survives of it in post-Holocaust Greece. So the project which at first was quite modest kept growing. And in this process I was always impressed with Vincent’s adaptability, organization skills, diplomacy, patience, tenacity and overriding belief in the integrity and meaning of the task. Vincent forged excellent ties with the Romaniote community. His photos, which often involved long set up times and exposures, drew many of the synagogue community into his work so that many aspects of Before the Flame Goes Out were collaborative efforts with the community itself. His patience was often rewarded by the stories told by those watching, many of who subsequently became portrait subjects, and he often donated prints of his work to these new friends and the community. Photography developed into oral history that became an important part of the work. Vincent also reached out to historians and other specialists (such as myself) to expand and refine his knowledge of his subject, so that photography and oral history now link with more traditional lines of historical inquiry. For his work on Before the Flames Goes Out Vincent received grants from the Memorial Foundation of Jewish Culture and he was a Fullbright Scholar in Greece in 2007. His talent was recognized by many generous donors who supported Before the Flame Goes Out. These included The Horace W. Goldsmith Foundation, The Carl and Lily Pforzheimer Foundation, The Lucius and Eva Eastman Fund, The Cahnman Foundation, The Rothschild Foundation, and The David and Goldie Blanksteen Fund. Vincent received his B.A. from SUNY, Oswego where he majored in history and anthropology, tw0 disciplines he remained dedicated to in his subsequent career. He went on to study photography at C.W. Post College (Glendale, NY), the International Center of Photography, and with Arthur Leipzig. In the 1980s he worked for R/ Greenberg Associates as Head of the Animation Camera and Stills Department, during which time he won seven Clio awards for television advertising campaigns. And the GT Group in New York as head of the still photography department. For the past 25 years Vincent worked as photographer, filmmaker and technical consultant for scores of book, film and other photo-related projects. In more recent years he took on projects for himself, and developed impressive portfolios of memorable and artistic work, most of which seemed to dwell with modes of memory. A skilled portraitist, he brought that careful steady observant eye to his photos of architecture and landscape. As a New York photographer two of the most meaningful to Vincent were Hidden New York (Rutgers University Press, 2006), for which he was a contributing photographer and remembrance, a book of portraits from September 11, 2001. Vincent was so often behind the camera there are few photos of him. I include this one snapshot, when I caught him by surprise at Kehila Kedosha Janina back in 2005. The picture captures for me his mix of toughness and playfulness. He combined a no-nonsense attitude of getting the shot, with humor and constant enthusiasm for his subject. Here are four photos which show a mix of his work with 8 x 10 negatives, and two shots from Greece done "on the fly" with a 35mm camera. These are low-res digital copies. The originals are especially gorgeous. (ISJM) On 11 December 1960, Algerian Arabs attacked the Great Synagogue in Algiers. Two years later Algeria gained independence from the France. The anti-French synagogue attackers "entered the holy place and went on the rampage, tore the memorial plaques off the walls, ripped up the symbols of our faith, sullied books and Torah scrolls, emptied the lockers where people stored tallit, tephilin and prayer books, and torched everything." 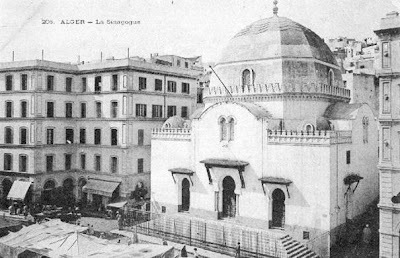 Albert Bensoussan and Julien Zenouda have written an accounts of the events of events leading up to the pillage and what happened to Algiers Jews afterward. 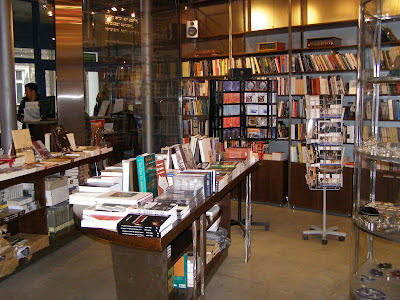 The article has been summarized in English on the blog Point of no Return. 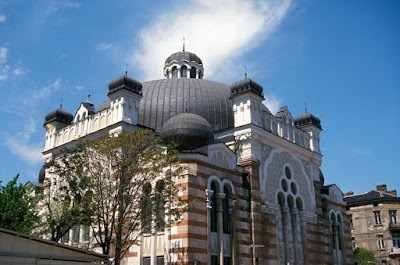 The building was erected in 1885, and is now a popular centrally-sited mosque. A tall minaret was added ca. 1961. In the 1990s, a covered ablution area was built on the forecourt of the former Great Synagogue. 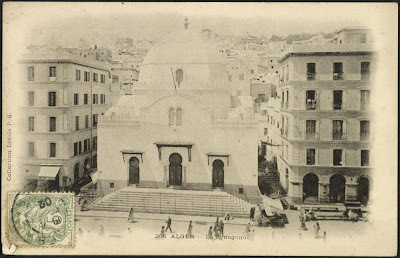 Inhabitants of Algiers reportedly refer to the building as "the mosque of the Jews" (Djamaa Lihoud) it is also known as the "Djamaa Ben Fares". USA: Should We Call Classicism in Georgia Georgian? Atlanta, Georgia. Hebrew Benevolent Congregation. W. F. Denny, architect (1902). From postcard. Architectural historian Richard Funderburke has referred me to the Macon Georgia Living history map webpage for some fine photos of Congregation Beth Israel in Macon, Georgia. Richard is a font of knowledge about Georgia architecture, and I've referred to his work elsewhere on this blog. I've been to Savannah, but never to Macon and a score of other towns that have or had Jewish communities. Sometime I hope to afford the time and money to make my own march through Georgia and adjacent southern states to more fully investigate the rich Jewish and architectural history of that region. At present, I'm particularly interested in the persistence of classicism, which in the south has its own particular overlapping and intersecting levels of meaning. Classicism was the style of the elite in the ante-bellum period and we are fortunate to have Beth Elohim in Charleston - literally a touchstone building for American Reform Judaism - as a reminder of how Jews were close to that elite in aspirations if not always in social status. They were not Christians, but they were white. Therefore the widespread use of Greek and Roman classicism beginning around 1900 is only due in part to national trends, since it is also steeped in a strong regional affinity and sense of history. One has to remember that it was a Jew - Commodore Uriah Levy - who undertook to preserve the Jeffersonian (and Palladian) appearance of Monticello. The Palladian form of Monticello - which derives from Rome's Pantheon and is a seen is many types of American civic architecture plays a role in Southern synagogue design, too. I discuss this in brief - but not to the extent that it deserves - in a new article "Arnold W. Brunner and the new classical synagogue in America" that will appear shortly in Jewish History. While the famed Touro Synagogue at Newport, designed by colonial-era architect Peter Harrison and completed in 1763 is typically described as of "the Georgian Style," since it was erected during the English Georgian style, in this article I touch upon a very different Georgian classicism - that found in Atlanta and Macon a century ago. Meridian, Mississippi. Temple Beth Israel (1905, demolished 1964). From postcard. In recognition of Richard's link about Macon, I include a few paragraphs from that article - though they are out of their full context, and without their full accompanying end notes. Already in 1902, two Roman temple style synagogues were erected in Georgia. In Atlanta, the Hebrew Benevolent Congregation dedicated on September 12, 1902, a large new Roman temple style home, designed by Louisville-born W. F. Denny (1875 - 1905), at the corner of South Pryor and Richardson Streets. 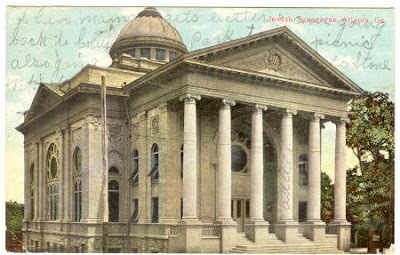 The Atlanta Constitution called this structure “one of the handsomest church buildings in the city.” Actually, in old photographs the building appears to have been mostly Renaissance in style, but it had a projecting porch facing the street consisting of six large Ionic columns supporting a robust entablature and pediment. Denny also was the architect of the Jefferson County Courthouse in Louisville in 1904, so perhaps it is no surprise that the synagogue looks something like a courthouse. Rabbis from several states attended the dedication. 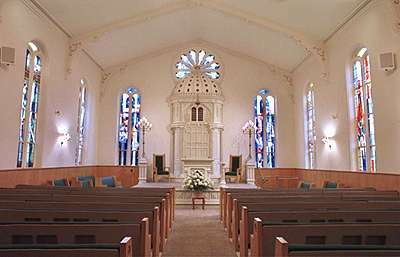 Rabbis were there from both Chattanooga, Tennessee, and Richmond, Virginia, both cities where classical style synagogues were subsequently dedicated in 1904. Congregation Beth Israel in Macon, Georgia, also built an imposing Roman-temple type building in 1902, designed by local architect Peter E. Dennis. 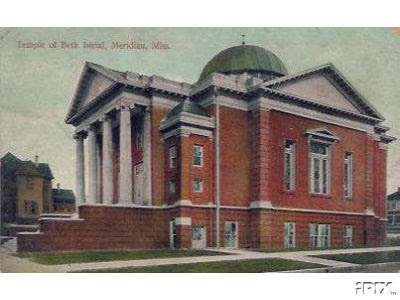 In 1905, a year before Brunner’s Brickbuilder article, three “modern classic” temples had been dedicated in Mississippi alone; in Meridian (demolished 1964), Natchez, and Greenville. 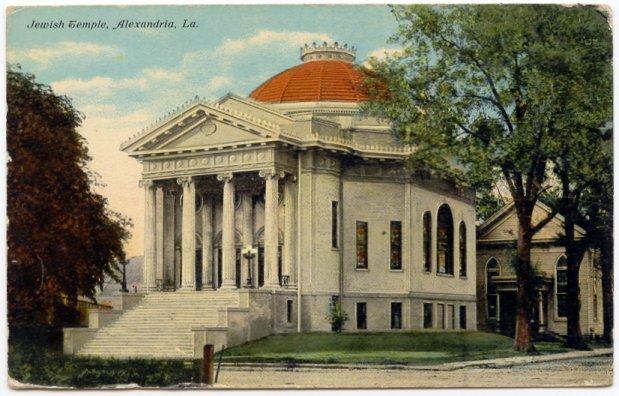 A similar 450-seat synagogue in Alexandria, Louisiana opened in 1907. Significant classical style synagogues were erected in Chattanooga (1904), Richmond (1904), Louisville (1906), Kansas City (1907), St. Louis (1908) and New Bern, North Carolina (1908), among many other places. The normality of these buildings and their religiously neutral or ecumenical appearance is seen in a postcard from Louisville that pairs the new Temple Adath Israel with the First Christian Church. The two buildings are virtually indistinguishable, except that the synagogue displays a Decalogue (Ten Commandments) set within its pediment though historian Lee Shai Weissbach has pointed out that this Decalogue was never installed.x Many of the other classical synagogues of the period did include Jewish symbols as pediment decorations, particularly the Star of David, though on most of these buildings symbols were unobtrusive and façade inscriptions were usually in English, not Hebrew. A favorite line used on the façades of Reform Temples is “My house shall be a house of prayer for all peoples (Isaiah 56:7). The quotation, always presented in English, was a proclamation intended as much for the general community as it was for the Jewish congregants. It signified – as did the classical architecture – the attempt at near-ecumenicalism of the Reform Movement. In the 1920s, when the classical style became widespread among Conservative and Orthodox congregations, their buildings always had inscriptions in Hebrew, though sometimes English was also included. Richard D. Funderburke, "Willis F. Denny II, Architect: A Brief Career, a Lasting Influence," Preservation Bulletin (January 1995); and “W. F. Denny (1874-1905),” in New Georgia Encyclopedia, http://www.georgiaencyclopedia.org/nge/Article.jsp?id=h-715&hl=y (posted 2002, accessed Nov 14, 2008). According to Funderburke, Denny’s work “reflects the major shifts in design that took place at that time when the picturesque, eclectic forms of the Victorian era gave way to neoclassicism and more historically accurate period revival styles.” For more on the synagogue, see Janice Rothschild Blumberg, As But a Day to Hundred and Twenty, 1867-1987 (Atlanta: Hebrew Benevolent Congregation, 1987), 55 ff. Steven H. Moffson, “Identity and Assimilation in Synagogue Architecture in Georgia, 1870-1920,” in Alison K. Hoagland and Kenneth A. Breisch, editors, Constructing Image, Identity, and Place: Perspectives in Vernacular Architecture, volume 9, (Knoxville: University of Tennessee Press, 2003), 151-165. Lee Shai Weissbach, The Synagogues of Kentucky: Architecture and History (Lexington: The University Press of Kentucky, 1995), 74-75. In addition to the 1870 Reform Congregation Berith Sholom in Troy, New York, of which I have just written, I was intrigued by the architecture and urban survival of the Orthodox Congregation Beth Tephilah at 82 River Street, right on the southeast corner of Russel Sage College, where it has survived surrounded by parking lots. I have not been inside the building, I haven't found anything in my files, and I haven't yet researched this locally, but the application of a Classical portico on the facade of the otherwise very unclassical building intrigues me. From the outside it looks like an earlier block or two-tower facade has been modified to create a partly classical facade, or perhaps an entirely new facade has been grafted on to the main body of the building. All I've found online are the mention of two dates for the building - 1873 and 1909. Was the congregation founded in 1873? Does the main bulk of the building - which clearly has internal galleries for women - date this early (I don't think so)? Was the design of the building changed during construction, or was the classical facade added to an earlier building in 1909 to give it a new look? I've just written an article that is coming out in the journal Jewish History in which I make the case that the revival in classicism - especially in making fully formed classical temples for Reform congregations - was part of the broad branding process of Reform Judaism in the period from about 1900 until World War I. After the war, Reform tends to move to new styles, while through the 1920s Conservative and Orthodox congregations more commonly employ classicism in their own way. If any part of Beth Tefilah is from 1909 I'll have to reconsider what is going on. Still, the situation is not unknown. 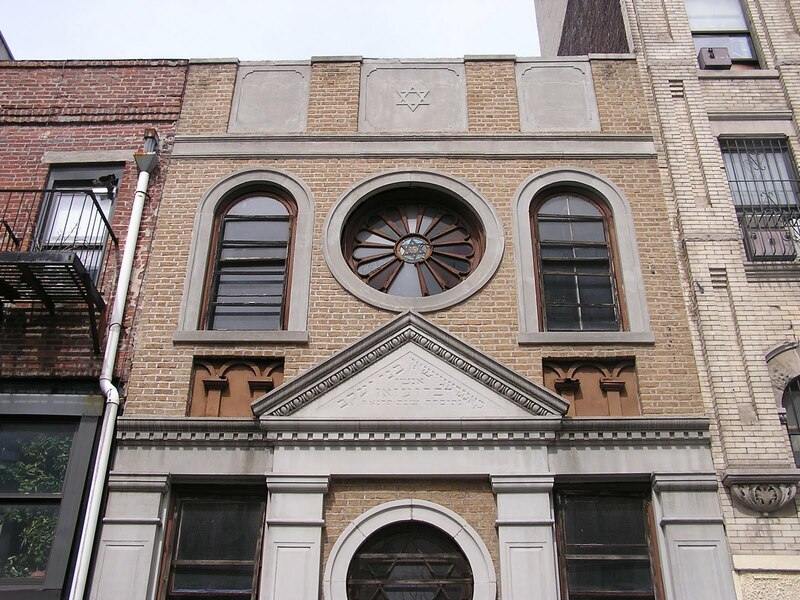 On the Lower East in New York the tiny Stanton Street Shul, built in 1913, also employs classicism on its facade, though little else in the building suggests not the glories of the ancient world of Greece and Rome - but only Galicia, the land of Yiddishkeit. There is another story that needs to be told here, too. Who fought to save this building when everything around it was torn down (in the 1970s?). How has a congregation managed to maintain it since then. Is really used, and how often? What is the future for Beth Tefilah? I can't wait to get inside this shul on my next visit to Troy...and lean more of this history of this congregation and building. (ISJM) Last weekend I had the pleasure to walk the streets of downtown Troy, New York for a few hours. 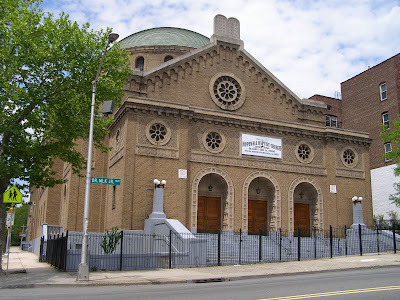 The Hudson River city located just north of Albany is rich in 19th and early 20th century architecture, including two historic synagogues, the older of which is Congregation Berith Sholom (originally Baris Scholem), at 167 Third Street, founded in 1866 and built in 1870. Troy, New York. Congregation Berith Sholom. Facade, 1870. Photos: Samuel D. Gruber, 2010. 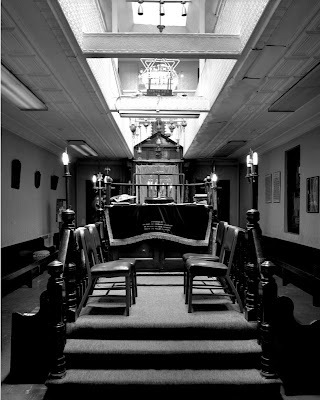 The building, which has been attributed to Troy architect Marcus Cummings, is the oldest in standing synagogue building in New York State outside of New York City, and the oldest New York Synagogue continuously in use for the same congregation. The congregation was liberal from the beginning, and the Ark was built on the west side of the building lot, and there does not seem to have been a balcony. A more formal adoption of Reform ritual did not take place until 1890. The congregation joined the Union of American Hebrew Congregations in 1920. Around 1953 an addition was built to house the religious school. This year, on the occasion of the building's 140th anniversary the congregation launched an Anniversary Expansion Capital Project. The synagogue is part of the Central Troy Historic District, one of the largest contiguous designated historic districts in the country. Judging from at least one historic photo, the restored facade looks much as it did more than a century ago. The appearance is what I'd call Gilded Age eclectic, but still mostly dependent on mid-century Romanesque and Italianate church forms and architectural details. Troy, New York. Congregation Berith Sholom, interior. The interior is much changed. The stained glass windows date from 1965, and the interior walls were probably once stenciled, perhaps they were painted white when the windows were installed. The Moorish arch of the Ark links this building with contemporary Reform synagogues of the period. According to congregation lore and explained by Rabbi Debora Gordon it was apparently added some time after the construction of the synagogue and was dedicated to the memory of a young congregant and Harvard sculler (maybe a scholar, too) who died in a boating accident: "A young man of the community died in a boating accident on the Hudson River, and his family donated the Ark as a memorial to him. Behind the ner tamid, where you would ordinarily expect to find words about God or holiness, script letters almost too fancy to read spell out “In memory of Emanuel B. Mount.” The Ark was designed to look like the scull in which he was rowing when he drowned. If you visit our cemetery, you will see on his grave marker a carving of a young man in a long, slim boat." I'm somewhat skeptical of the likening of the Ark to a boat - in photos it doesn't seem too different form some other Arks of the period - but I still have not been inside the synagogue, nor seen the cited inscription, so I reserve judgment until my next visit to Troy. I wonder what this Ark would have looked like originally? Was it bare wood finished with a high shine? 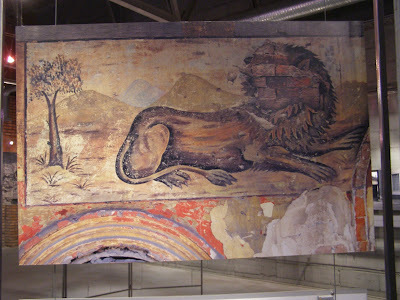 Or was it painted or gilded in rich colors and gold. I'll try to find out, and am happy to hear from any readers who know more about this venerable - but still vital - building. Troy, New York. Congregation Berith Sholom, Facade with view of site where extension will be built. No side windows are on the northeast corner because an earlier building was there. Photo: Samuel D. Gruber, 2010. Troy, New York. 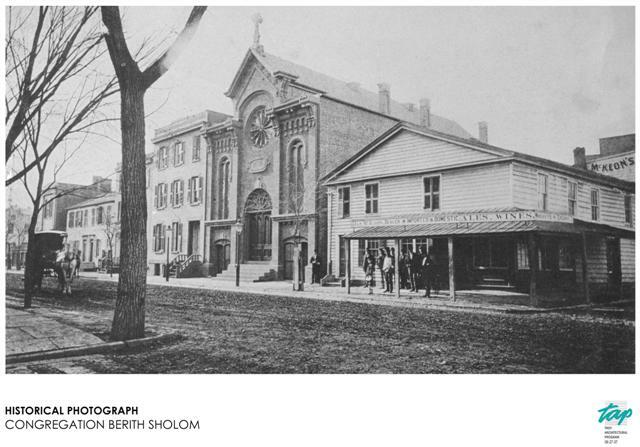 Congregation Berith Sholom, rear of building showing abutting building. Photo: Samuel D. Gruber, 2010. Above: Old (New) Synagogue of Mainz, destoryed on Kristallnacht (from postcard). 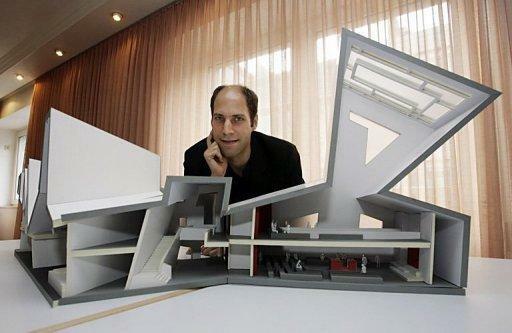 Below: Architect Manuel Herz with model of new synagogue (photo: AFP). Last month Germany opened its newest - and most unusual synagogue building. The Mainz Jewish community is one of Germany's most historic - dating back at least to dynamic intellectual heyday in the Middle Ages. Now the small community is the most contemporary and cutting edge - at least architecturally. As Gavriel Rosenfeld explains in an article in The Forward, architect Manuel Herz's design is something entirely new. It derives not from any traditional (Jewish or otherwise) building vocabulary, but from the very vocabulary and calligraphy of Hebrew prayer. This is in stark contrast to other new synagogues in Germany - notable the monumental synagogue in Munich that recalls the architecture of the Jerusalem Temple in its stark and simply geometry and massing. Formally, the new Mainz synagogue is obviously inspired by the architecture of Daniel Libeskind (with whom Herz studied), most notably at his museums of Osnabruck and Berlin. From what I can tell from photos, the synagogue combines the drama of the Berlin Jewish Museum with the intimacy of the Nussbaum Museum in Osnabruck (which is now being expanded - so what the future holds is still unknown). The construction of a new synagogue is always an occasion for celebration, so it was with particular pomp that the Rhineland city of Mainz recently dedicated its new synagogue and Jewish community center. The dedication ceremonies, held September 3, featured an array of German politicians, including German President Christian Wulff. Many of them blessed the new building and underscored its symbolic significance. Yet, while the synagogue received its share of blessings, it also gave physical expression to them in its architectural form. Designed by the German-Jewish architect Manuel Herz, Mainz’s striking new synagogue complex traces its inspiration back to the third “blessing” in the Amidah — the Kedusha. 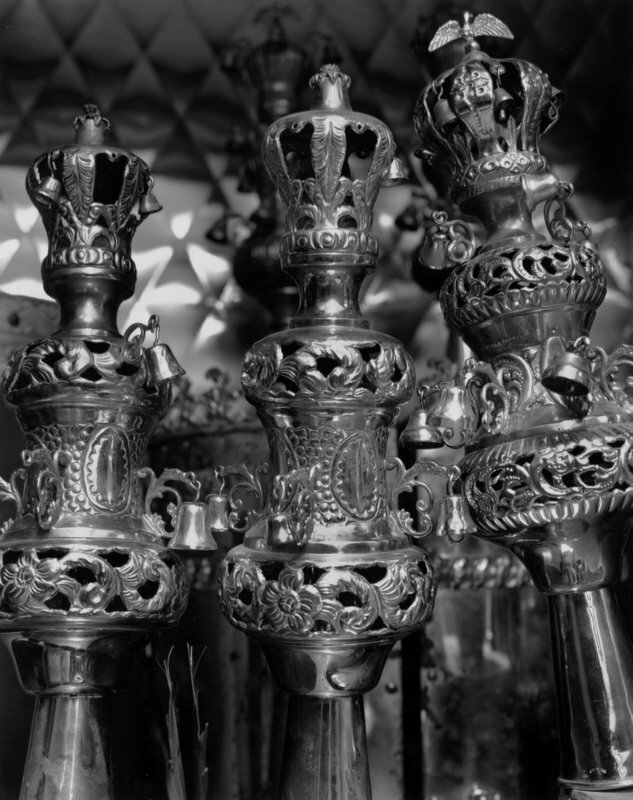 The connection between the word and the synagogue’s appearance is not immediately obvious. But Herz’s drawings for the building reveal that its sawtooth form partly derives from the jagged pattern produced by the word’s five Hebrew letters: kuf, daled, vav, shin and hay. You can also read more about the synagogue and Mainz here. (CHAGALL, MARC). Chaliastra. [Yiddish Language Art Periodical]. No. 1. Avant-garde illustrations, including Chagall’s designs to David Hofstein’s poems (pp. 10 and 48). pp. 71, (1). Lightly browned. Original color-illustrated wrappers bound into modern boards, front cover tape-repaired, back cover detached. Sm. folio. Kestenbaum & Company’s Fall auction of Fine Judaica will take place on Wednesday, October 27th at 1pm at the firm’s Manhattan gallery located at 242 West 30th Street. Viewing beforehand will be held from Sunday, October 24th through Tuesday, October 26th. 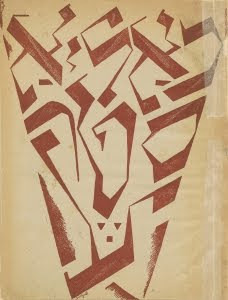 The extensive sale of Hebrew Printed Books, Manuscripts, Autograph Letters and Graphic Art will include American-Judaica and Rare Books from the Library of Gratz College, Elkins Park (Part II); German, Haskallah and Related Books from the Library of the Late Philosopher, Prof. Steven Schwarzschild and Exceptional Rabbinic Autograph Letters from a Private Collector. Hebrew Incunabula are particularly coveted by discerning book collectors and this auction offers a number of them for sale. Most compelling are several leaves from the first publication of the Talmudic Tractate Kidushin, Guadalajara, circa 1480, at an estimate of $35,000-50,000. This early Spanish fragment is of the utmost rarity (lot 279). Two other incunabula of note include a 1484 copy of Yedai’ah Bedersi’s Bechinath Olam, estimate $10,000-15,000 (lot 53) and a scarce second edition (incomplete) of the Soncino Roman Machzor, 1486, at an estimate of $10,000-12,000 (lot 210A). Additional important early Hebrew Printed Books include two works by Samson ben Isaac of Chinon -- Sepher Kerithoth, estimate $6,000-8,000 (lot 261) and Peirush HaGet, estimate $3,000-5,000 (lot 262) both were printed in Constantinople in 1515. Good examples of Early Bibles in the sale include the first Polyglot Bible, Genoa, 1516, estimate $4,000-6,000 (lot 55) and Estienne’s splendidly printed pocket Hebrew Bible, bound in 14 volumes, Paris, 1543-46, at an estimate of $4,000-6,000 (lot 56). A later Bible of significance is a Hebrew Pentateuch from Vienna, 1815, government-authorized to be used in the Courts of Law in Prague to administer the Oath to Jewish witnesses, estimate $2,500-3,500 (lot 64). Highlights among the Passover Hagadoth in the sale include a copy of the second Amsterdam Hagadah with a large folding map of the Holy Land, 1712, estimate $4,000-6,000 (lot 141), a most unusual Hagadah printed in English by the London Times newspaper on August 17th, 1840 in relation to the Blood Libel raised against the Jews during the “Damascus Affair”, estimate $5,000-7,000 (lot 143) and the Toulouse Hagadah, produced from memory by Jews imprisoned in French internment camps during the Second World War, estimate $5,000-7,000 (lot 154). Other notable volumes include two Chassidic Books related to the Chabad movement, both written by Shneur Zalman of Liadi- - Likutei Amarim (second edition), Zolkiew, 1799, estimate $8,000-10,000 (lot 80) and Likutei Torah (first edition), Zhitomir, 1848 and 1851, estimate $3,000-5,000 (lot 83); a Machzor according to the custom of Catalonia, Salonika, 1526, estimate $2,000-3,000 (lot 211) and a Machzor, Amschel Mayer Rothschild’s personal copy, Roedelheim, 1800, at an estimate of $2,000-3,000 (lot 258). Early medical and scientific books are represented by first editions of Tobias Cohn’s Ma’aseh Tuvia from Venice 1707, estimate $2,500-3,500 (lot 88) and Joseph Solomon Delmedigo’s Sepher Ma’ayan Ganim, Amsterdam, 1629, at an estimate of $2,000-3,000 (lot 98). Among books relating to Germany and the early Haskallah movement, of particular interest is Johann Jakob Schudt’s Jüdischer Merckwürdigkeiten which chronicles the life of the Jews of Frankfurt, 1714, estimate $1,500-2,500 (lot 126) and the first German edition of the Mishnah, 1760-63, at an estimate of $700-1,000 (lot 236). The American Judaica section of the sale features unique selections such as a handwritten Hebrew Marriage Certificate dated July 1861 from Peoria, Illinois, estimate $12,000-18,000 (lot 21). Also prominent within the Americana section are a number of “firsts”: Isaac Leeser’sHebrew-English Pentateuch, the Yuly copy bound in five volumes, Philadelphia, 1845-6, the first such translation published in America, estimate $7,000-9,000 (lot 12); Judah Monis’ Grammar of the Hebrew Tongue, the first Hebrew Grammar published in the New World, Boston, 1735, estimate $10,000-15,000 (lot 7), a volume of The Jew, edited by Solomon Henry Jackson, distinguished for being the first Jewish Periodical in America, New York, 1823-4, estimate $5,000-7,000 (lot 11); and The American Magazine for June 1758, containing a Rabbinic sermon in English, the very first such text published in America, estimate $5,000-7,000 (lot 8). Books relating to Israel and Zionism include two significant editions of Theodor Herzl’s important manifesto, Der Judenstaat; The first Hebrew edition, Warsaw, 1896, estimate $2,000-3,000 (lot 285) and the first edition to be printed in America, New York, 1904, at an estimate of $2,000-3,000 (lot 286). Further offerings include an early and fascinating Palestine Telephone Directory from 1938, estimate $1,000-1,500 (lot 188) and the first edition of Charles Forster’s study of Hebrew inscriptions found in the Sinai Desert and published with albumen photographs, London, 1862, at an estimate of $800-1,200 (lot 186). Other books of interest include the first edition of Baruch de Spinoza’s highly influential philosophical work Opera Posthuma, Amsterdam, 1677, estimate $6,000-9,000 (lot 278), Bernard Picart’s illustrated Histoire Générale des Cérémonies, Moeurs, et Coutumes Religieuses de tous les Peuples du Monde, complete in seven volumes, Paris, 1741, estimate $3,000-5,000 (lot 306) and a Hebrew translation of William Shakespeare’s Othello, which was the first appearance of any of Shakespeare’s plays in the Hebrew language, Vienna, 1874, at an estimate of $600-900 (lot 267). Prominent among the modern Art and Literary Books is a rare complete set of the short-lived journal Albatros, which had enormous impact upon the modernist Yiddish literary scene in Poland, estimate $1,500-2,500 (lot 139) and Marc Chagall’s illustrations for the Yiddish language art journal Chaliastra, Paris, 1924 at an estimate of $800-1,200 (lot 295). 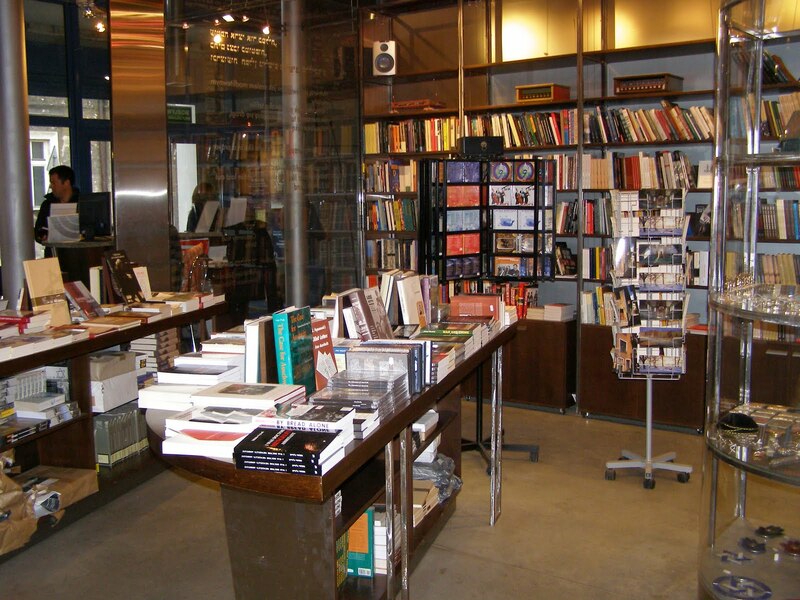 Many illustrated books are featured in the auction including: Meir Gur-Arye, E. M. Lilien, Moritz Oppenheimer, Ze’ev Raban, Reuven Rubin, Issachar ber Ryback, Raphael Soyer, Joeseph Tchaikov, Anna Ticho and Wilhelm Wachtel. Leading the offerings in the Manuscripts Section of the sale is a large Prayerbook according to the meditations of Rabbi Isaac Luria, 1732-38, at an estimate of $20,000-25,000 (lot 352). The auction catalogue cover lot, a striking Family Tree from Vilna, begun in 1901, is extraordinary for its elaborate and most original artistry. The pre-sale estimate is $15,000-20,000 (lot 349). 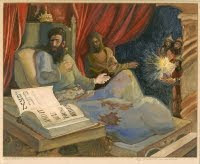 Additional highlights are Moreh Tzedek an extensive manuscript penned in the 18th century by the Sha’agath Aryeh’s first cousin, estimate $10,000-12,000 (lot 362), a collection of Hebrew medieval manuscript fragments, estimate $5,000-7,000 (lot 357) and a Pinkas from the legendary Churvah Synagogue, Jerusalem, 1889-96, at an estimate of $5,000-7,000 (lot 351). The Autograph Letters section of the sale is particularly impressive and is sure to garner buyers’ attention. Consigned from a single Private Collection, on offer are written communications by some of the most important and influential Rabbinic authorities of the 19th and early 20th centuries. Included are letters penned by Israel Abu-Hatze’ira (the Babi Sali), Abraham Mordechai Alter (the Grand Rabbi of Gur), Moshe Yitzchak Gewirtzman (Reb Itzikel), Shlomo Goldman (Reb Shloimkeh Zeviller), Samson Raphael Hirsch, Abraham Isaiah Karelitz (the Chazon Ish), Moses Sofer (the Chatham Sofer) and Yoel Teitelbaum (the Satmar Rebbe) among others. Of special note are letters by Yisrael Meir Kagan of Radin (the Chofetz Chaim), estimate $15,000-20,000 (lot 332), Menachem Mendel of Shklov, estimate $25,000-35,000 (lot 337) and Reb Chaim Soloveitchik, estimate $12,000-18,000 (lot 342), a most surprising letter written to Chief Rabbi Kook. A petite section of Graphic Art rounds out the sale. It includes a particularly striking gouache from the Book of Esther by Saul Raskin, estimate $3,000-4,000 (lot 363). For further information relating to bidding or any other queries, please contact Jackie Insel at 212-366-1197. New York, NY. 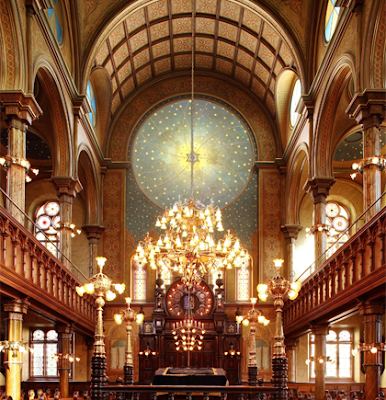 Eldridge Street Synagogue, views of Ark wall with 1944 windows, and design, installation and projection of new window by Kiki Smith and Deborah Gans. Photos: Courtesy of Museum at Eldridge Street. Tomorrow - October 10, 2010 - the Museum at Eldridge Street in New York City will introduce a monumental new stained-glass window by artist Kiki Smith and architect Deborah Gans. This permanent artwork is, in the words of museum's website, "the culminating piece of our 24-year, award-winning restoration of the 1887 Eldridge Street Synagogue, a New York City and National Historic Landmark. The introduction of this installation in our historic sacred site marries the new and the old, and places the museum at the crossroads of art, architecture, history and preservation." See and hear on video Smith and Gans discuss their concept by clicking here. The new design will replace a tablet-shaped glass block window, introduced in 1944 after the original stained glass was damaged. At the time, the congregation did not have funds to return it to its original grandeur. 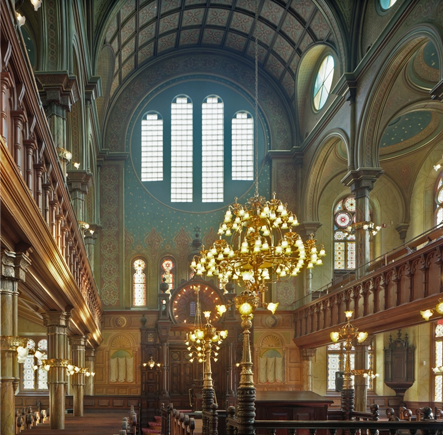 The treatment of the replacement in the course of restoration of the entire 19th century synagogue interior highlighted a classic preservation dilemma: How do you treat an important design element that has been lost or altered, and does every phase of a building's history have equal value in the conservation/preservation process. The Museum staff met with leading architects, preservationists, historians and curators to help decide how to treat the window. I was, in a small way part of this process, when I gave a lecture at Eldridge on the "The Choices We Make." For the Museum, the choices were retain the 1944 glass block, attempt to "replicate" a lost window the original design of which remains unknown, make something new "in the style of" the 1880s, or to create something new and admit it as such. In the end, the latter course was chosen, with the caveat that whatever was new would harmonize with the old. Overall in the tot la restoration of the building the past was well served. There was nothing wrong with acknowledging the present, and looking to the future. 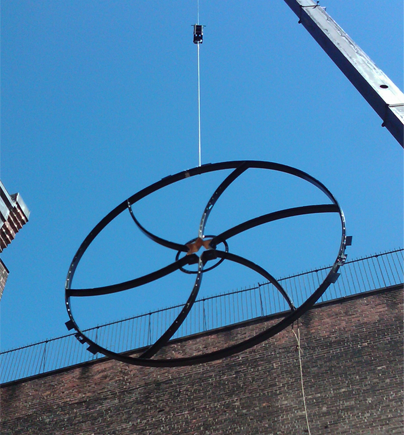 According to Robert Tierney, Chairman, New York City Landmarks Preservation Commission, "With the [upcoming] installation of Kiki Smith and Deborah Gans extraordinary window in this sacred landmark, Eldridge Street's evolution now spans three generations built in the 19th century, preserved in the 20th, and renewed in the 21st." 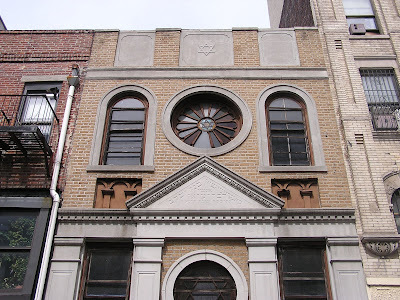 I have frequently written about the Eldridge Street Synagogue project, begun in the 1980s, on just completed last year. This Sunday, October 10 marks the first day the new stained-glass window will be open to the public. Tickets are $500 & $1,000. RSVP is required. Honoring Kiki Smith & Deborah Gans and with dedication remarks by Mayor Michael Bloomberg and writer Adam Gopnik and music by Paul Shapiro’s Hester Street Orchestra. Join Kiki Smith and Deborah Gans for a behind-the-scenes look into their vision and process for the Museum at Eldridge Street’s magnificent new stained-glass window.